Let The New Year Begin!!! May Your 2015 Be Filled With Love, Health And Joy! Happy New Year everyone! I hope you all had a wonderful Holiday Season! Have you set your New Year’s Resolutions for the year? My 2015 resolution is to work less around the home and make more time to play with my family. As a mom my life is so jam packed with everything I have to do in the day I find I don’t have the time to enjoy just being with my family as much as I would like. Even when my children were little I was always more the caregiver/housemaid and my husband the playful parent. Not that we didn’t do lots of things together just that I wish I had done more. One of my kid’s favorite activities when they were little was blowing bubbles outside. They loved watching the way the bubbles, especially really big ones reflected the light and scenery around them, turning different colors with the sun’s reflection. We used to blow bubbles in the rain too so they wouldn’t pop when they hit the ground and the kids would run around trying to stomp on them all. Their next favorite activity was playing with sidewalk chalk. We would draw roads all over the end of our street and the kids would draw a house each and ride their bikes and toy cars over the roads to each other’s homes all day long. My daughter Anya still loves drawing with sidewalk chalk only today it is road art being created instead of roadways. Now that my kids are getting older there are still activities we enjoy doing together. My kids love hosting games nights with our friends where we play board games, card games and electronic games of all sorts young and old. We love going for walks out in nature or just up to the mall, and going out for lunch or movies together one on one. These are some of the things I want to do more of in 2015. I would also like to make sure we get in at least one if not more camping trips this year as it is something we all love and haven’t made time for the last couple of years. So this year I encourage you all to join me and make a promise to yourself and your family to spend more time playing and less time being busy with chores. Our children are only young once and we will never have this moment with them again in our life time. 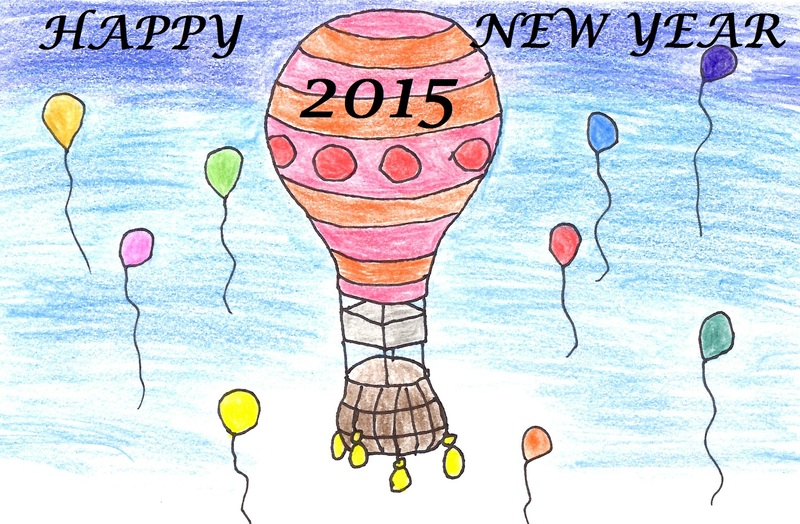 I hope you enjoy the family time you create in 2015. Kids love to bake with their mom or dad. It can be a rewarding experience for the parent and child. Not only do they get some one on one time together there are delicious treats too. Okay, so the kitchen may get a little messier than normal and take longer to clean up. Oh, and when it comes time to cleaning the child has already lost interest and moved on to something else leaving the parent with the baking mess. It is still a lot of fun for everyone involved. Other than muffins or cookies throughout the year the only time I bake is it Christmas. 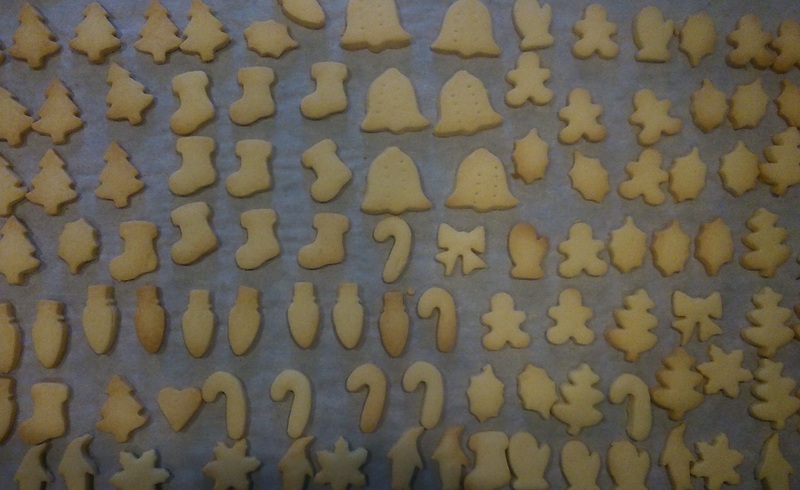 Years ago my cousin and I started a tradition of getting together for a baking weekend to prepare our Christmas treats. When she moved away I carried on the tradition with my Aunt. It is a wonderful weekend and the kids have always loved it as they got to bake and try many different treats instead of the usual cookies or muffins. The kids would come in and out of the kitchen working on their favourite recipes and leaving when they had had enough. It usually took about three days for us to get everything finished. This year for a change I went over to my aunt’s house for our annual baking weekend and unfortunately my kids missed out. My aunt and I however, worked like busy bees and had all the shortbread, biscotti, butter tarts, squares and nuts & bolts baked, with icing and wrapped in a day and a half. We were both surprised how quickly we finished everything and it was so peaceful, no fights over who could stir the batter, crack the eggs or add the ingredients. It was a great mommy time weekend and although I felt a little guilty doing it all without including my children I think I would try it again. 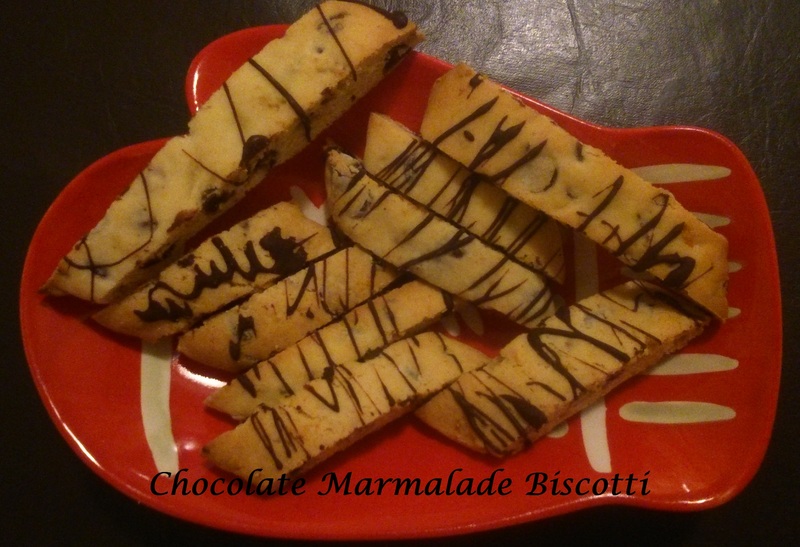 My kids loved tasting samples of everything when I came home and I saved a couple of their favourite recipes to make with them too so they could get in on the Christmas baking experience with me. Using an electric mixer, beat butter and sugar until creamy. Beat in eggs, marmalade and orange peel until combined. Sift dry ingredients together in a separate bowl, stir into creamed mixture, add nuts and chocolate chips and work into a dough. Turn onto a floured board surface. Shape into 3 to 4 logs about 1/2 inch thick. Place on parchment paper lined or lightly greased pan. Bake 25 minutes @ 325° until firm and light brown. Cool on a wire rack for five minutes. Cut diagonally 3/4 of an inch wide. Place back on the cookie sheet leaving space around each slice. Return to oven and bake another 10 minutes or until golden brown. When cooled drizzle with melted chocolate. With the sun setting earlier and evenings getting colder Winter is fast approaching and family activities are starting to move indoors. I don’t know about you but if my family had their way they would be watching shows, video gaming, painting or reading all winter long. All great activities but sometimes a change is good. Last year we started a new activity to mix things up a bit. Once a month we would host a Family Games Night at our house. The kids would invite their friends over and some of our neighbours would drop by with their kids. Everyone would bring a snack to share to keep it simple and we would have a massive Family Games Night. There would be Wii Just Dance livening up the basement, Dominos, Settlers of Catan, Monopoly, Aggravation, Apples to Apples, Charades and any other game you can think of to play. Games nights quickly became a family and friend favourite. Everyone had such a great time and all ages could participate. It was the perfect “What to do” on a Winter Night solution. 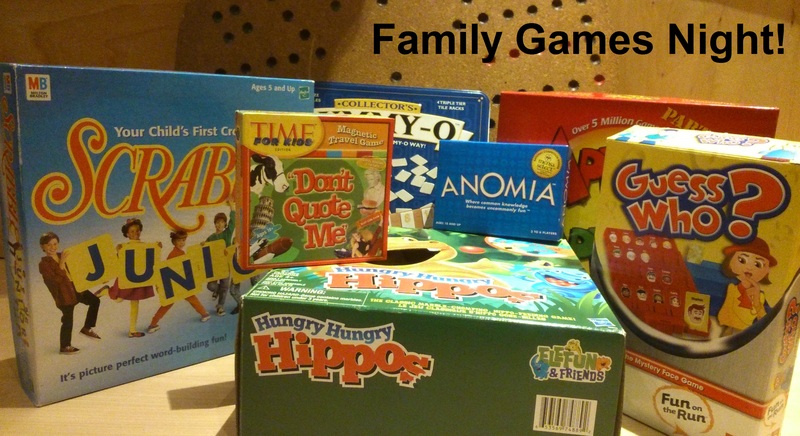 Family games nights became so popular we started hosting them more frequently throughout the winter months. If you have never tried one I would highly recommend it. They are a fun way to brighten up the greyness of winter and bring some fun and laughter into your home. Have an Idea? Leave a comment……. Karen Wisdom on Reach Out To Those In Your Life Who Have Made A Difference…. Jan Miller on Reach Out To Those In Your Life Who Have Made A Difference…. Karen Wisdom on Merry Christmas To Everyone! love Mom on Merry Christmas To Everyone!